Need to block the western sun from your windows, cover a deck or screen your window for privacy? 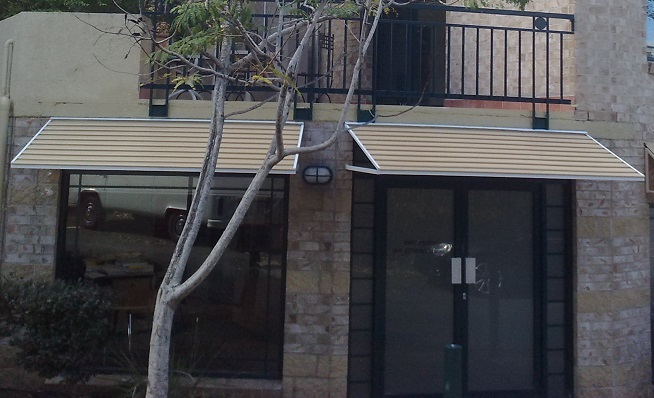 Our Gold Coast aluminium awnings specialists have the solution. Aluminium awnings truly are the ‘all weather’ awning. Low maintenance and easy to clean, Gold Coast aluminium awnings are totally waterproof, ideal for withstanding heavy downpours. Available in a vast array of colours, with tough powder coating with excellent durability, All Season Awnings can advise on a variety of Gold Coast aluminium awnings and louvre designs to suit your property. The adjustable louvre gives you total control of how much sun and heat gets into your home whilst allowing adjustment to let the light and breeze through. Aluminium hood awnings block the sun then rapidly cool at the end of the day to give you comfort when the Australian elements are at their peak. Gold Coast aluminium awnings hooded designs come in all sizes and colours; with gloss white underneath. Panels run vertical for a traditional aluminium awning look. 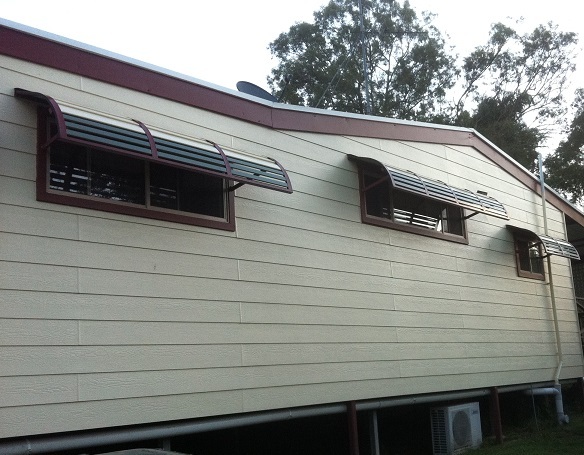 Louvres are an excellent way to keep the sun off your windows. 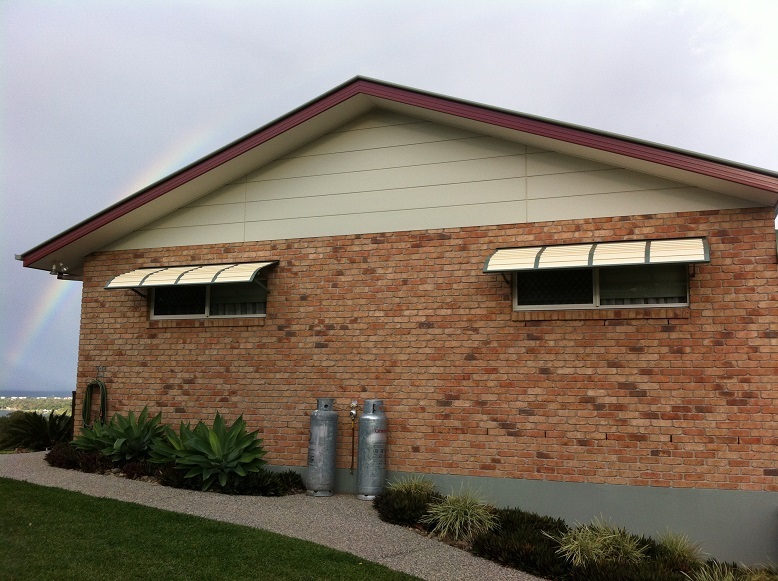 The aluminium fixed louvre is designed to give you the best compromise for sun protection and cooling breezes. Great for privacy all year round. The Claredale is a traditional window hood awning that comes in a range of bullnose shapes and colour combinations to suit your home. The gloss white underneath helps reflect natural light inside, while you enjoy excellent protection from heat and sun. Optional open or closed sides. Perfect for shade, security and privacy applications, aluminium privacy screens come completely powder coated in a variety of colours to suit your property. Using a slightly different construction method, where the aluminium sheet is clipped together, not pop riveted, ensures a waterproof finish for this style of Gold Coast aluminium awnings. See below for details of the popular Pacific, Bahama, Stafford and Kingston styles. Aluminium awnings can be used to create a more contemporary look, with panels that run horizontal, not vertical. Available in many different colour combinations, these Gold Coast aluminium awnings offer ideal protection from the elements. A classic awning style, this horizontal panel awning is extremely versatile and provides excellent sun protection. Features a curved hood and is also available in flat design. Choose from a huge range of powder coat colours to suit your home. The Stafford or Kingston awning is the ultimate all weather awning. Low maintenance, efficient design makes it ideal for patios, decks, balconies – any type of outdoor area. Totally waterproof, it features a unique clip system with no visible fixings. Available in a huge range of colours, with pearl white underneath to reflect natural light. Another classic horizontal slat awning style, the Pacific awning is waterproof at 20° pitch. The click lock system creates an attractive look underneath. Available in a range of colours – a great Gold Coast aluminium awnings style to use on verandahs, small patios and windows. A great shade solution. Using a combination of pacific panels and slats with polycarbonate joining sections creates a different look that is smart and effective – perfect to create a statement. Choose from a huge range of colours to suit your home or business. The clean lines of the Bahama awning make it a popular choice. It also features neat horizontal slats which are visible underneath. Waterproof at 12° pitch, this is a great choice for weatherproofing windows, small balconies and patio areas.